#firepainting happened bytotal accident. I was in Ballinskelligs, Co Kerry, on a residency and was losing my mind, what I wanted to go down to Kerry to focus on (painting) was not happening at all. I wanted to paint the coast and its rugged beauty but I couldn’t paint a straight line. For four days I spat and screamed at canvas begging for inspiration to come and it didn’t! So then on day four I decided to try lose control and let a sort of expression happen, to ‘vomit’ paint and god knows what onto the canvas. After enough time had past of me making what I thought was just a pointless mess, I placed the canvas to one side for the bin and didn’t realise that where I was placing it had an open flame right beside it. It went on fire and in a panic I started to blow on it but nothing happened, so I had to turn it over on its face. When the flame went out and I turned it over again the results were amazing, I instantaneously loved it. The rest of the residency was spent dabbing my hands, fingers, and arms with burn spray. 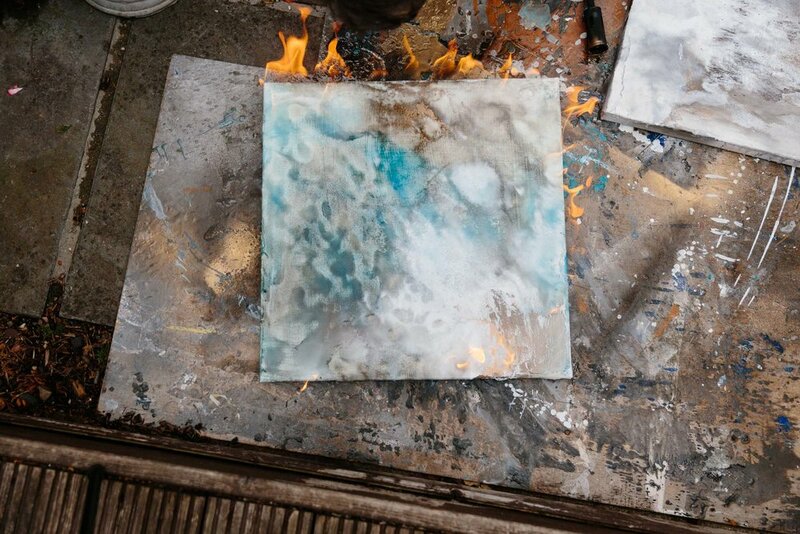 Thirteen years later I still haven’t gotten enough of #firepainting, it’s only now I have become able to master it a bit more. To manipulate it as best as I can, after all fire is an element and can never be fully tamed no matter how hard you try. After two years of manipulating fire and nature and 13 years using fire, I have only now begun to build up an equal relationship with fire, (as strange as that sounds) and to understand it. Some days the fire is too much and you just have to let it burn out. Usually when it’s cooled down the canvas falls apart and flakes away. Luckily the frame is still intact, so after my initial rage at the fire painting going wrong dies down, I re-stretch the canvas and start from the beginning. I have to respect the fire and try to remember it will always be worth it in the end. Within the last two years I have also learned when to step away from a piece. All too often paintings(andmine in particular) can be overworked. When this happens the painting is suddenly gone from you and it can feel like a travesty.